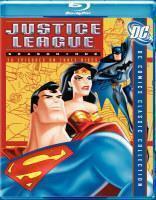 After a long wait, fans were finally treated to Justice League’s first season on DVD via way of a four disc set back in March of 2006. Whether this is a good or bad thing is really up to your opinion of the shows first season. While I was extraordinarily excited to see the premiere of Justice League (to this day I remember watching the premiere with ex-World’s Finest admin “The Flash” and our comments on how strange this all looked, being the first all digital DC toon), the first season proved to be a tumultuous ride. Quite a few episodes held plenty of enjoyment (“Brave and the Bold”, “Injustice For All”, “Legends”, “A Knight of Shadows”, “Savage Time”), but there were others that are considered some of the worst, by fans standards, that are hard to overlook (“War World”, “Metamorphosis”…”War World”). Justice League’s first season brought together the seven greatest heroes the world has ever known. Superman, Batman, Wonder Woman, The Flash, Green Lantern, Martian Manhunter and Hawkgirl came together during Earth’s darkest hour when an alien invasion threatened all of mankind and together they were able to prevent the Earth from being overtaken by the invaders. Joining forces, the seven formed the Justice League, an intergalactic crime fighting force that not only allowed them to better fight crime on Earth but also on distant planets that needed their help as well. With thirteen stories spread across twenty-six episodes comprising the first season, Justice League proved by the end that it had what it takes to not only be a solid superhero show, but to also become one of the best. Even with the hard-to-stomach episodes, this season does provide its fair share of action. If you keep in mind that this was the Timm-verse teams first foray into such a large roster of superheroes, they can’t be expected to get it right the first go around. Indeed, the second season of Justice League was much improved over the first, with a few design tweaks (goodbye old Superman!) and with more fleshed out characters. Repeated viewings of the season have proven to me that even the worst episodes here are still not too bad, especially not as bad as I remember, but it’s really the color palette that threw me for a loop more than anything. Due to calibration issues between Warner Bros. Animation studios and the animation studios overseas that the episodes were animated in, this season came back looking a lot brighter in tone than originally planned (this was fixed for season two and subsequent seasons) and as such a lot of episodes just look too…alive. There’s too much being shown at times and while episodes like “In Blackest Night” and “Legends” are bright episodes to themselves, other efforts like “A Knight in Shadows” still look far too lit and that in itself is one of the biggest drawbacks of the season. Other rough patches include the voice actors getting into their characters (aside from Conroy who, as Batman, is nothing short of a pro at this point in time), especially with George Newbern (Superman) and Susan Eisenberg (Wonder Woman), who sound extraordinarily stiff for the majority of the season. As with the animation, they change for the better in later seasons, so it’s just a case of the Monday’s for this first season. Also awkward for the series was the two-episode per-story format, which was only done intermittently on other series and never for entire seasons. At times in this first season the story rarely feels it should have been stretched to forty minutes, but others, like “Legends”, work so well that you don’t really care how awkward the rest of the season feels at times. Pretty much all of the episodes presented here are enjoyable to watch, even if episodes like “War World” are included. I really just dislike that story, more for just the lame story than anything. I actually dig “Metamorphosis”, despite it being rather hated by fans (or at least was when it originally aired—who knows what they think of it now), and I don’t have a problem with any of the other episodes on the set, to be honest. Back when they originally aired I no doubt dissected them till I was blue in the face, but now that I can just enjoy them, the flaws are less glaring to me, although I still do notice little quirks that the first season has in comparison to later seasons. 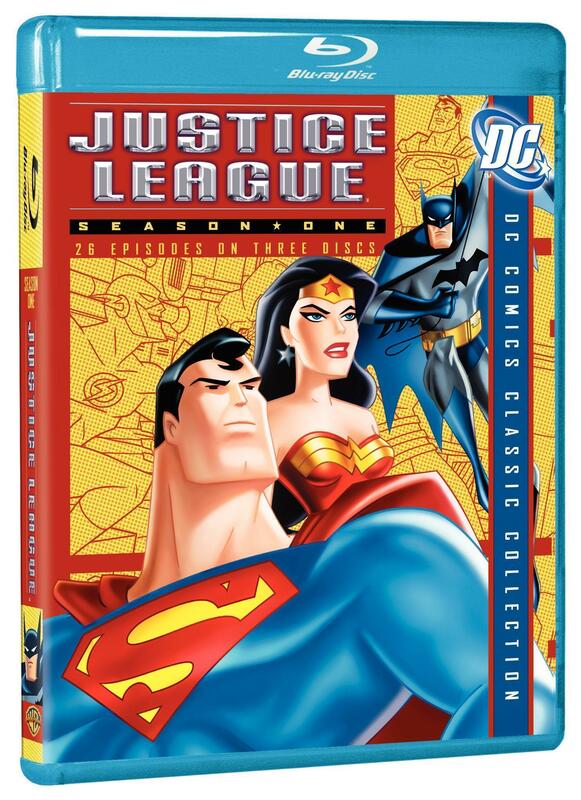 Warner Home Video brings Justice League’s first season to Blu-ray, making it one of the first animated series to be released on the format and the first animated effort from Warner Bros. Animation on the format. The three-disc set is housed in a Blu-ray case that is ever so slightly larger in spine thickness than standard cases. Disc art is the same as the first three discs of the original DVD set (Superman, Batman and Wonder Woman) and a little booklet mirroring the same art as the original packaging of the DVD release. Those who aren’t familiar with this packaging can check it all out here. And so we move onto the Blu-ray portion of the set. One thing I had hoped for with this release was that we would see the 16×9 transfers for this season come to light. While the season was animated in 4×3, it was formatted for 16×9 so that any data that was cropped off the top and bottom was something easily sacrificed (i.e., Batman’s ears or Superman’s boots). It wasn’t a major issue, but seeing as the Blu-ray format is almost entirely made up of widescreen content, I couldn’t see a better reason to release this set other than to give the fans who wanted the widescreen transfers. Well, Warner apparently didn’t believe any of this, as we once again receive the full screen transfers. Now I was content with the fullscreen transfers on DVD because, well, it was DVD. But this is Blu-ray and as absolutely stunning as the show looks in 1080p (and they do look nice, but I’ll get to that later), why they chose to release it in 4×3 once again, I have absolutely no idea. It seemed like such a no-brainer to me and it would have undoubtedly sold more sets if the ugly 1.33:1 aspect ratio wasn’t listed on the back of the packaging, which alone will likely prompt many to pass this set on by, since those who will be picking this release up will likely be watching it on a widescreen set. So with its 1.33:1 transfer, how does the set look? Well, I’ll be honest…once I got over my dislike of the aspect ratio, the set really does look pretty damn nice. The horrendous transfer for “Paradise Lost” is finally gone and replaced with a crystal clear 1080p VC-1 encoded transfer. It all looks fantastic and to watch this series in such clarity is something I’d never thought was possible. Compression is non-existent and there were even chapters worked into the mix, so it’s much easier to skip about episodes now. The video is definitely a plus for the set, but the Blu-ray goodness doesn’t stop there. We’re also treated to a Dolby Digital 5.1 mix that is also quite respectable in its own right. While I doubt you’ll notice a whole lot of new audio popping up in surrounding channels that your A/V receiver didn’t already matrix out via Pro Logic IIx, the new mixes do have a bit of bass to them, which is a nice change up from the previous release. It isn’t anything that will rock the house, but it is a decent mix regardless and those hoping to experience the series in a more thrilling manner will no doubt be pleased. The only other Blu-ray elements to the disc to talk about is the menus, which…there really aren’t any. The pop-up menus are easy to navigate, but as for any real “home” menu, there isn’t much of one and the majority of your navigating will be done via the pop-up, as, like all Warner Blu-ray discs, the content auto starts once inserted. After this, the rest of the bonus content on the disc is repeated from the previous DVD release. First up are the three audio commentaries, which are all very informative, though one has to wonder why they didn’t choose to talk over the premiere episode of the series. The “Legends” commentary is a particular treat because I absolutely love that story. Fans will complain that they don’t talk over both parts of the episode, but as they’ve proven on STAS episodes, they can pretty much condense all their thoughts of an episode arc into one commentary. In addition, they often talk over their favored episodes in the multi-part arcs (hence why “Savage Time” part two has the commentary). Also of note is in “The Enemy Below” commentary, they tackle the issue of Justice League in widescreen. The mandate for season two being released in widescreen on DVD is even stronger after listening to this commentary. “Inside Justice League” is a great featurette that features the producers of Justice League. Jason Hillhouse is back moderating and does a great job asking questions and setting everyone up for some informative talk from the creative team. A lot of the information most fans will know already from browsing the internet, but it’s nice to have it one, tight package. “Justice League: The First Mission” features an intro by Jason Hillhouse, James Tucker and Bruce Timm explaining how this early footage was created. While many thought that it was just the repeated easter egg of the original JL pitch found on a previous DVD release and still others hoping it was new—well, you’re both right. This pitch, while featuring all the footage from the previous easter egg version, features new footage that throws in a female Cyborg character, Impulse and even Robin into the mix of the Justice League. It’s certainly a lot of fun to watch, though you have to be glad that this isn’t what eventually came out (as even Tucker and Timm will attest). Looking at the rest of the special features, you can probably already deduce that they’re repeated special features from the single disc releases. 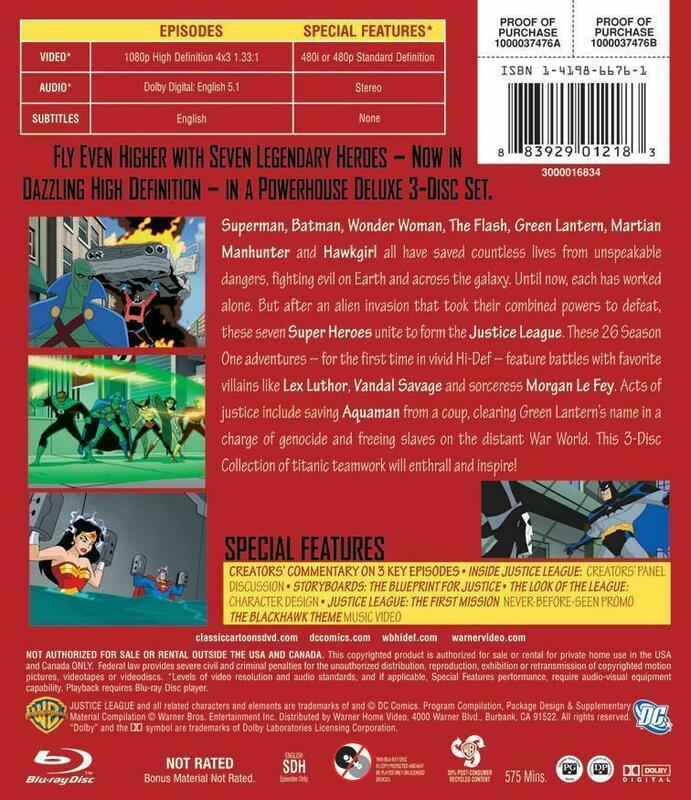 While the Bruce Timm episode intros are not to be found on this release, “The Look of the League” and “Storyboards” are repeated special features from the single disc outings. This is nice for those who didn’t purchase the single disc releases, but disappointing for those who already saw them the first go-a-round. Also included here, although not in Easter Egg form this time around (as it was on the first season DVD release), is the “Blackhawk Theme Music Video.” It’s just out in broad daylight for the Blu-ray release, likely because there aren’t any menus here to hide anything in. Overall I’m mixed on this set. 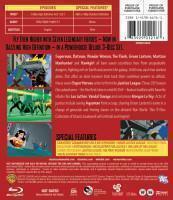 I want to recommend it because I want to see the rest of Justice League and Justice League Unlimited on Blu-ray, but in good conscience I can’t recommend that fans plunk down over $40 (as it is currently priced on Amazon as of this writing) for a set with zero new content and transfers that are still 4×3. Perhaps if there was a rebate deal going around like Paramount or Disney do with their Blu-ray upgrades, but the full price on this set is just way too hard to swallow if you already own the previous DVD release. Sure, the video and audio is nice and a definite upgrade from the DVD release, but even if you have the equipment to show it off properly, a 4×3 transfer and a rather subdued 5.1 audio mix isn’t going to exactly wow anyone. I wish I could tell you this was a fantastic set, but fans shouldn’t be too surprised this is a rehash in the greatest sense. I suppose I expected too much, but I still had opens, even up to putting the disc inside the PS3, that Warner would have just misprinted and there would actually be widescreen transfers here. I know I’m picking on that one element a lot, but the Blu-ray format isn’t mainstream enough for buyers to put up with this type of mistreatment. The market for this set is incredibly slim and I’m not entirely sure that Warner did anyone any favors by releasing it. Still, I hope it sells well enough for future seasons to be released, as those will undoubtedly be worth the upgrade, new extras or not. As is, this one is only recommended if you are a serious die-hard and have the cash to spare.